State natural areas were acquired to protect the state’s natural diversity, provide sites for research and environmental education, and serve as benchmarks for assessing and guiding use of other lands in the state. Natural areas are defined as tracts of land or water which have native biotic communities, unique natural features, or significant geological or archeological sites. Generally, natural areas are remnant areas which largely have escaped disturbances since settlement or which exhibit little recent disturbance so that recovery has occurred and presettlement conditions are approached. Natural areas provide an important reservoir of our state’s genetic or biologic diversity. They act as important reserves for native biotic communities and provide habitat for endangered, threatened, or critical species or other species of special concern to scientists. They often include areas with highly significant geological or archaeological features. They tend not to have much facility development, though there may be a designated trail or two on site. Some properties allow limited hunting. Access: Please contact the University of Wisconsin-Madison Arboretum at (608)263-7344 for access permission. Description: Hub City Bog is an unusual tamarack bog island and tall shrub community. A pine/hemlock relict and associated shaded cliffs are also present. 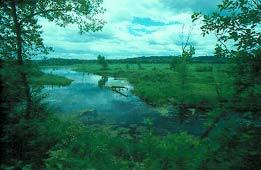 This uncommon Driftless Area bog was formed in an oxbow lake left by the meandering Pine River. To the east of the bog is Soules Creek which flows at the base of a 75-foot sandstone cliff. The north-facing cliff supports a northern forest of hemlock, white pine, and yellow birch with a ground cover of Labrador-tea, trailing arbutus, bunchberry, wintergreen, and Sullivant’s cool-wort. The tamaracks in the bog have suffered nearly 70 percent mortality due to an infestation of larch bark beetle. However, some tamarack reproduction is taking place. Many springs are present in the tamarack swamp. Most typical bog plants are absent, although sphagnum moss and some very showy species are found. Hub City Bog is owned by the University of Wisconsin and was designated a State Natural Area in 1970. Location: Richland County. T8N-R2W, Section 7, S¼. 190 acres. Access: From the junction of State Highway 60 and County Highway T in Port Andrew in southwestern Richland County, go west on 60 5.2 miles to an access lane on the south side of the highway, just before the bridge. Park at the end of the lane and walk southeast 0.5 mile to the site. Description: Richwood Bottoms features one of the best swamp white oak dominated floodplain forests along the Lower Wisconsin Riverway with some of the largest oaks reaching 2 feet in diameter. The extensive bottomland forest varies from a typical southern wet-mesic forest along the river to a drier bottom forest located on sandy alluvial ridges divided by swales. Swamp white oaks with basswood dominates the low ridges while the flats contain silver maple with American elm, green ash, and river birch. Also present are hackberry and bitternut hickory. The understory includes buttonbush, cardinal flower, wood nettle, ostrich fern, royal fern, lance-leaf fog-fruit, false nettle, and groundnut. Poison ivy is common throughout. This area provides good quality habitat for wildlife that requires isolated blocks of mature forest including the three state-threatened birds which nest here: red-shouldered hawk (Buteo lineatus), Kentucky warbler (Oporornis formosus), and cerulean warber (Dendroica cerulea). Richwood Bottoms is owned by the DNR and was designated a State Natural Area in 1991. Smith Slough And Sand Prairie Location: Richland County. T8N-R2E, Section 11 and Section 12, 375 acres. Access: From the intersection of U.S. Highway 14 and State Highway 130 (S) in Lone Rock, go west on 14 1.5 miles, then south and east on an access road about 0.7 miles to a parking lot and boat launch. Description: Smith Slough and Sand Prairie contains a large complex of plant communities located in the Wisconsin River floodplain on alluvial sand deposits that fluctuate no more than 6 feet in topography. The site hosts a shallow seepage-fed oxbow lake that has become hydrologically isolated from the river. Lying south and west of the lake is a large undisturbed complex of sedge meadow, shrub-carr, and aquatic emergents that grades into big blue-stem dominated sand prairie and swamp white oak savanna on slightly elevated ridges. On the sand terraces along the lake is a narrow band of black oak barren with a ground flora of sedges, big and little blue-stem, and cream wild indigo. On higher ground is an area of open sand and old dunes that are now stabilized by false heather, black oak, and river birch. Also present is a bottomland hardwood forest dominated by swamp white oak with silver maple, green ash, American elm, and river birch in lower swales and swamp white oak, red oak, basswood, and yellowbud hickory on slightly higher ground. Some trees are in excess of 4 feet in diameter. Of note is a plant species of special concern –the small forget-me-not (Myosotis laxa). Animal species of concern include the state-endangered starhead topminnow (Fundulus notti), and goldeye (Hiodon alosoides); state-threatened Blanding’s turtle (Emydoidea blandingii); and least darter (Etheostoma microperca). Smith Slough and Sand Prairie is owned by the DNR and was designated a State Natural Area in 1991. Location: Richland County. T8N-R2E, Sections 4, 5. T9-R2E, Section 32. 270 acres. Access: From the intersection of U.S. Highway 14 and County Highway JJ in in Gotham, go east on 14 0.2 mile, then south on Timber Lane past the sawmill to the bike trail and a gate. Park and walk due south along an overgrown access easement to the northwest corner of the western tract. The eastern section is accessible only by boat from the Wisconsin River. Description: Located on Wisconsin River sand terraces, Gotham Jack Pine Barrens contains the largest and best remaining black oak and Jack pine barrens in Richland County. Also present is a floodplain forest of young timber and a small, shallow oxbow lake of high water quality, a sedge and grass dominated wet meadow, dry sand prairie, and open sand blows. The barrens is located on undulating terrain composed of very old sand blows and dunes and is recovering from past grazing. The tree canopy is quite closed and the understory remains nearly shrub-free with a ground layer dominated by sedges. Some areas are still moderately rich in native species including big and little blue-stem, Indian grass, prairie cord grass, green milkweed, silky aster, flax-leaved aster, prairie coreopsis, gray goldenrod, rough blazing-star, goat’s-rue, and bird’s-foot violet. The floodplain forest is composed of silver maple, green ash, river birch, swamp white oak, and American elm. The unusual wet meadow is dominated by cord grass, blue-joint grass, rushes, and sedges and contains no shrubs and is nearly devoid of forbs. The area contains numerous rare plants and animals. Plant species of concern are small forget-me-not (Myotis laxa), poppy mallow (Callirhoe triangulata), and sycamore (Plantanus occidentalis). Animal species of concern are tiger beetle (Cicindela patruela ustulata) and flat floater freshwater mussel (Anodonata suborbiculata). Gotham Jack Pine Barrens is owned by the DNR and was designated a State Natural Area in 1994. Higgins EyeLocation: Richland County. T8N-R1E, Section 4. T9N-R1E, Sections 33, 34, 35. 20 acres. Access: From the intersection of Highways 14, 60, and JJ in Gotham, go west on 60 2.4 miles, to the upper part of the beds. The natural area encompasses the northern part of the river for 3 miles downstream. Description: Orion Mussel Beds features a narrow corridor of Wisconsin River bottom and adjacent shoreline that is critical habitat for numerous rare animals. Fifteen rare animals are known from this site including mussels, mayflies, dragonflies, beetles, and fish. The river bottom contains a rock and gravel substrate with underwater sandstone ledges, which contrasts with the shifting sands that are more typical of the Lower Wisconsin River bottom. The firm substrate that supports these species is restricted to a very narrow zone beginning at the shoreline extending south over the course of 4.2 miles. A diversity of rare mussels are found here including the state-threatened rock pocketbook (Arcidens confragosus), monkeyface (Quadrula metanevra), and wartyback (Q. nodulata), and the federally endangered Higgins’ eye (Lampsilis higginsii). Rare invertebrates include the smoky shadowfly (Neurocordulia molesta), elusive clubtail (Stylurus notatus), Knobel’s riffle beetle (Stenelmis knobeli ), and Wallace’s deepwater mayfly (Spinadis wallacei). Uncommon fish include the mud darter (Etheostoma asprigene) and western sand darter (E. clarum). Orion Mussel Beds is owned by the DNR and was designated a State Natural Area in 1996. Location: Within Bear Creek Fishery Area, Richland & Sauk County. T9N-R2E, Section 1. T10N-R3E, Sections 19, 20. 80 acres. Access: From Lone Rock, go north on 130 6 miles, then east on Brown Church Road 1.2 miles. The first parcel lies just west of the road. To reach the second area, from the junction of 130 and Brown Church Road, continue north on 130 4.6 miles to the intersection with Highway N-east and park along N. The site lies southeast of the road. Description: Bear Creek Sedge Meadow contains two separate parcels–both sedge meadow communities with Bear Creek flowing through them. Also present is some shallow marsh along the creek. Both are recovering well from past grazing. Sedges are dominant and forbs are present in higher than normal densities. Cat-tail and bulrush are found in the wettest areas while the highest ground supports wet prairie vegetation. The midwestern endemic plant, glade mallow (Napaea dioica) is present along the creek. Other plants include blue-joint grass, sweet Indian-plantain, swamp aster, marsh marigold, swamp thistle, boneset, bottle gentian, mountain mint, and cup-plant. Breeding birds include wood duck, sandhill crane, belted kingfisher, alder flycatcher, willow flycatcher, sedge and marsh wren, common yellowthroat, and swamp sparrow. Clean water flows through the meadows suggesting the possibility of groundwater seepage. Bear Creek Sedge Meadow is owned by the DNR and was designated a State Natural Area in 2002.